CPaaS.io will have a booth in the EU-Japan area of the exhibition. 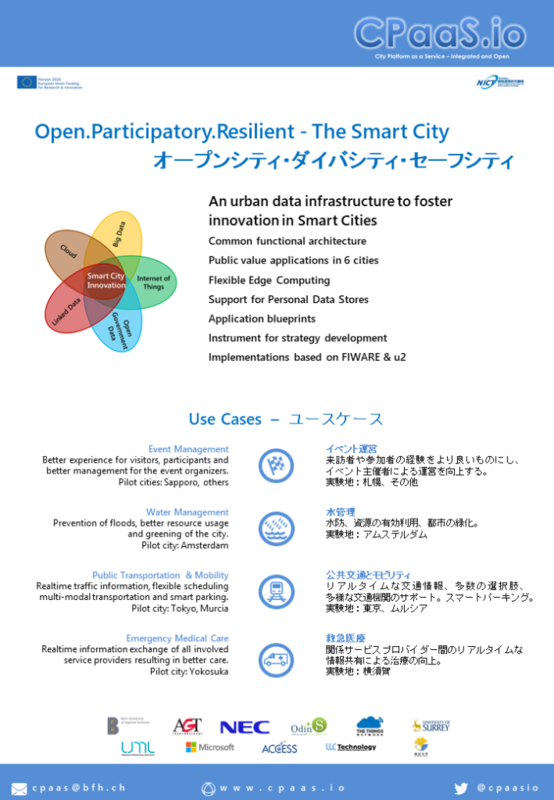 The main aspects shown will be: Federation of the European and Japanese CPaaS.io smart city platform instances, edge computing, and selected applications. The first demo is showing that data (e.g., sensor data) is transparently available across platform instances. The second demo is focusing on use cases like smart parking and Waterproof Amsterdam, demonstrating how the use of edge computing and LoRaWAN helps to make cities smarter. Visitors can see demos with live data from Europe and Japan. The demos should trigger discussions on the usefulness of the particular applications, but more so on the use of platforms as a basis and enabler for innovation in smart cities. Next Come to TRON Show!